You know that when they have exhausted all their arguments, they are just going to claim they are unable to access the site for a Forensic study because it would be "Sacrilegious" to do so. Actually, the charlatans often use the fraudulent argument of "the work can't be done on account of religious grounds". As poster ASMarques correctly remarked, it is not a problem if some French priest excavates a few pits containing a few dozen skeletons of alleged Jews allegedly killed by the EG in the Ukraine, but all of a sudden it becomes an unsurmountable problem when it comes to the AR camps, where in areas the size of large parking lots, some 2 million Jews are supposed to have been buried. What a joke! Fact is, had the story been true, we wouldn't even be talking about performing excavations today 'cause the Communists would have done it back in the 1940s. But it's all a L-I-E, a filthy and horrendous lie! There were no homicidal gassings during the war. Niemand wurde vergast! Greg, the best part about your site is that it is a Debate Stopper, many times on blogs & youtube videos I have demolished the opposition by simply asking them to take up your NAFCASH Challenge, putting an end to denial & earning $100,000 to boot! Needless to say, they never have a comeback. Thank you MrNobody. I guess the only thing I can add to that is, if it was a debate stopper before, it's even more so now. But what's even more amazing than the fact that they can't locate / prove the existence of just one tenth of one percent, they can't even locate / prove the existence of one single body, one single pound of bone fragments, one single ounce of human ash, and not so much as one single tooth! There was no Treblinka holocaust. There was no Sobibor holocaust. These sites were not extermination centers / death camps. There were no holocausts within the holocaust at these sites. 1/5th of the holocaust didn't happen. "For those of you who lack the courage to accept the above facts and wish to continue to deny the truth, then the ball is in your court. The supporters of THE FINAL SOLUTION FORENSIC CHALLENGE TM have put their money where their mouths are and it’s time for the criminally fraudulent holocaust industry, their mealy-mouthed “skeptical” minions, bought whores in the media and their servile Judas-Goats in our government indoctrination centers to put up or shut up. If you also lack the integrity to acknowledge the fact that there were no holocausts within the holocaust at Sobibor and Treblinka (1/5th of the entire holocaust), then ask yourself this one simple question: Why does THE FINAL SOLUTION FORENSIC CHALLENGE TM reward remain unclaimed?" Maybe 1/10th of 1% is too hard for them to locate / prove the existence of? Maybe $100,000.00 isn't enough incentive? HUGE MASS GRAVE LOCATED AT TREBLINKA!!! According to the dull one itself, all the "proof" needed to claim that there really are "huge mass graves" at Sobibor and/or Treblinka is the existence of a "green area" in the alleged "mass graves" areas of the alleged "pure extermination centers." Well, I'm about to help out the dolt and show him the EXACT location of at least one of Treblinka's "huge mass graves." See it? See the "lush green area" on the lower right between the two lower monuments? See? The "lush green areas" of Treblinka are just as "lush" and just as green as the "lush green areas" of Sobibor. 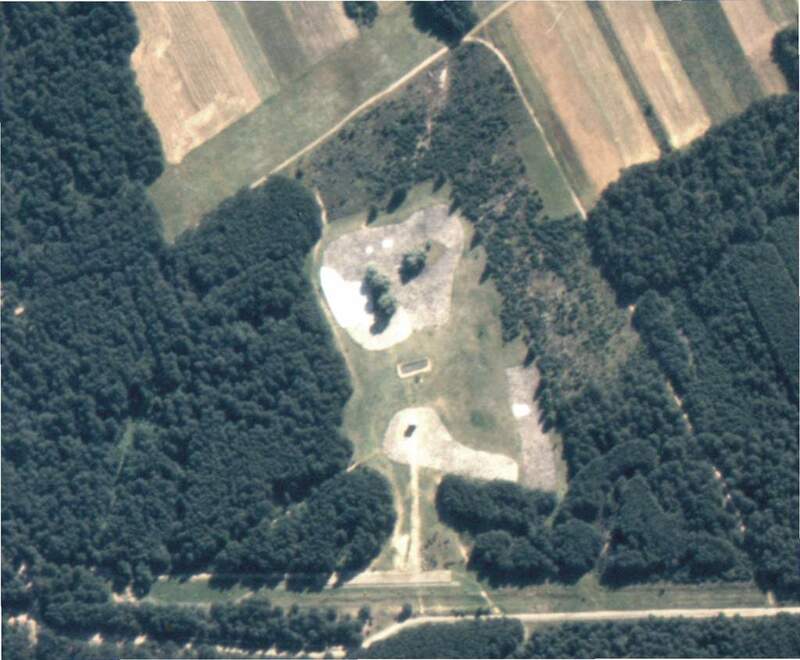 And check out the location - It sure looks to me like that "lush green area" / "huge mass grave" must be the Lazarette. Just think, with the tens of thousands of bullets and shell casings in that pit along with the remains of the tens of thousands of jews, one could prove it's the Lazarette pit with a cheap metal detector. So what is the dull one waiting for? How many bones do I have to throw him? Maybe $100,000.00 isn't enough of an incentive for him???? ?